“The Tiger Lillies”- British music band that astonishes the world with its unique and at the same time frightening image and creative works, and inexhaustible artistry. This band is one of those that cannot be rated neutrally: inevitably one likes them or not. 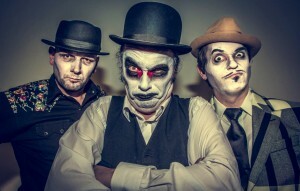 “The Tiger Lillies” formed in 1989 when Martyn Jacques announced that he s looking for a drummer and a bassist. He found Adrian Huge and Phil Butcher which were the ones that understood and supported Jacque’s idea. In 1995 Adrian Stout replaced the bassist and in 2012 the former drummer was also replaced by Mike Pickering. These people are the current members of one of the most unusual and eccentric groups in the history of music. The origin of the band name, as the actions of performers, is scandalous. It tells about the prostitute killed in the Soho area whose name was Lillie. She liked to wear tiger print clothes thus people started to call her Tiger Lillie. Jacques found out about her when he was living as a squatter, after he was drop out of the theology and philosophy studies. Then Jacques dived into the independent studies of opera. Multiple performances are not just about the songs. They intertwine with street theatre, full of gipsy and neocabaret elements. Essential accents of their image are: white makeup with black lips (sometimes red or imitation of blood), bowler hat, shabby suit with a vest or white shirt, and suspenders. These features make member of the band look like unhappy circus clowns or street artists. This image that they create carries back the audience to a specific time period. The genre of the music of “The Tiger Lillies” is mixed, it cannot be described in one word: songs are of different elements of jazz, opera, punk rock, English folk, German cabaret. Lyrics are controversy, touch the darkest places of life – “dirt” which is rooted in the society but usually no one talks about it, it is not popular to discuss it publicly. Drugs, criminal activities, prostitution, suicides, together with Bible, Jesus, sins, and themes of retribution are undoubted foundation for the works of “The Tiger Lillies”. The sharpness of texts, straightforwardness, anarchy, maneuvering between subtlety and vulgarity, too much or too little of the ideas of death are just a few characteristics of theatrical trio’s creations. “The Tiger Lillies” became popular in 2002 with a musical “Shockheaded Peter” which won 5 “Olivier” awards after it was shown in London. This musical is based on true nightmares that children had, and true horror stories which were written down by a Heinrich Hoffman, doctor of mental institution in Germany, more than 150 years ago (around 1840s). Songs were usually about what happens to “naughty boys and girls that rip their clothes apart and make noise”. It can be guessed that death “meets” them unexpectedly. Performance was equally horrific, shocking, and charming. In 2008, in a play “Seven deadly sins” these 7 biggest sins were interpreted with separate works which accented human’s natural brutality, dark, constantly (consciously and unconsciously) suppressed, side and punishment for the committed sin. Fall from the heaven to the hell portrayed using traditional English theatre dolls Pancho and Judy, the role of the dancer was dedicated to Ophelia Bit who is a representative of striptease and burlesque dances. All songs were performed in a high timbre that does not lay claim to any of the genres. Jacques sing in a high voice on purpose just to enhance the impression even more. This performance received a lot of critique, it was considered to be messy, vulgar, and band showed such bad taste that will never be forgotten. This play was compared as a mockery of the original Kurt Weill’s ballet-opera with the same name which was the inspiration for “The Tiger Lillies”. Despite the critique, trio kept their sinful charisma, were heard, and it does not matter what kind of responses they get. Affected by the themes of the lowest level of society and portraying them in a challenging and original way, this band is used to the negative reactions. Negativity usually comes from the Christians and animal lovers. When asked, what influenced him to create such band, Jacques said: “I was always an outsider who never belonged anywhere. I was alienated guy, spent my years in the “outskirts” of society. I started to view critically at what was really going on in the world and I am happy that I am still alienated enough, that I can live out of it. I believe that people like Marilyn Manson, Eminem feel the same and use it as their driving motive. If you feel comfortable in a society, you cannot inspire yourself to talk and create about darker things.” “The Tiger Lillies” started their career in the most rugged bars of London without any stage or microphones, with angry and disappointed audiences which unlikely payed attention to them. Member of the band lived the real nightlife. Nowadays they are being produced by the same agent as Kylie Minogue, “Oasis”, collaborates with well-known artists, over the career of 25 years they released 30 albums. One of them – “The Gorey End” – was nominated for the Grammy Award. Marilyn Manson recommends “The Tigr Lillies” as one of the best musicians for the weddings which can be considered as black humor – one thing that is full in the creative works and performances of this provocative musical band.